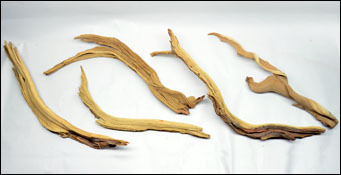 We have dried bamboo available in a variety of useful lengths ranging from 8" to 24", depending on your enclosure's size. A common choice for arboreal Gecko species. Cork is a lightweight & highly detailed type of wood which holds up very well in a variety of conditions ranging from ultra dry to ultra humid. It has a bunch of different uses ranging from loose decor to incorporation into fully custom backgrounds. We use Cork in the vast majority of vivariums we build at NEHERP, and Cork Flats are the least expensive option sold by the individual piece. We try to be fairly accommodating with individually purchased cork pieces, so if your cork is for something specific, let us know after you order. These individually selected rounds are selected & graded by hand, with less-than-great pieces being broken up into "Cork Gallon Bags" for sale at a discount. This unique grading process has been used since 2013 to ensure the individual rounds we ship look great, and have plenty of character. We try to be fairly accommodating with individually purchased cork pieces, so if your cork is for something specific, let us know after you order. 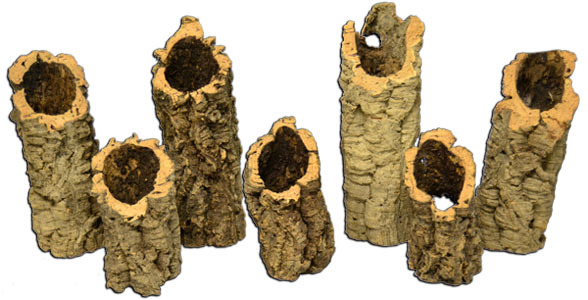 Our "stump" cork pieces are great for use as planters, faux stumps, land dividers, and more. They are basically just very short Cork Rounds which typically have a wider diameter than length. Most of these are hand-cut in house at NEHERP specifically for this purpose. Great for protecting plants from medium & large size inhabitants. Please keep in mind the below menu references outer diameter. These are large, super detailed, 18 to 25 inch length (usually 8-12" in diameter!) cork rounds that are unbeatable for large enclosures & custom background builds. 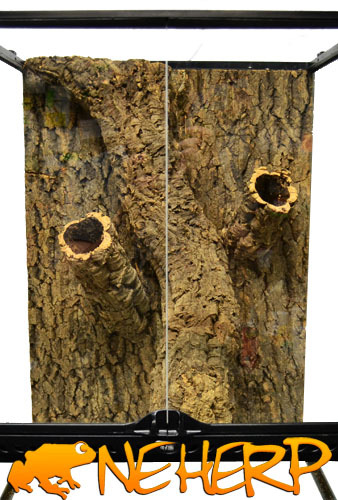 Show grade cork rounds are hand-selected for vivarium use, and we guarantee you won't be disappointed. These are the same large rounds you see @ expos, without the large price to match. 5lbs Case "Mixed Sizes" shown for general visual guide of quantity. As this is a natural product, your selection will vary. High quality cork pieces at some of the lowest shipped prices anywhere. All boxes will be mixed rounds & flats with no exceptions, to ensure our customers get the best price possible. Cases are hand-selected by NEHERP staff to include a wide variety with the enthusiast in mind. The "Cork will be used for..." box is for customers who are looking to do something semi-specific for a build. Examples: "Using for Orchid mounts" or "For custom background on an 18x18x18 terrarium". We cannot guarantee exact or specific piece requests in the bulk boxes. Weights are 100% guaranteed. This option includes a whole lot of smaller cork pieces (significantly more flats than rounds) that are excellent for use with cork mosaic backgrounds, decor pieces, and for those looking to mount small plants. This option includes plenty of surface area at the cost of larger pieces. Great for smaller plant mounts. This option includes a variety of large & small flats and rounds. Excellent for custom background builds, and for people looking for great looking loose decor pieces. (Rough average of 1-3 rounds per 5lbs, depending on size & availability) This is our most popular wholesale cork option. This option includes a handful of larger flats with the remainder filled in with small/medium rounds and flats. A common choice for building custom backgrounds, as the larger pieces will easily fill background space with the filler pieces acting as the "3D" decor. Great for larger plant mounts. These are finally back in stock after years of sourcing difficulty. Jungle Vines are ideal for being used loose in an enclosure, or for integration into one of our Custom Background Kits. 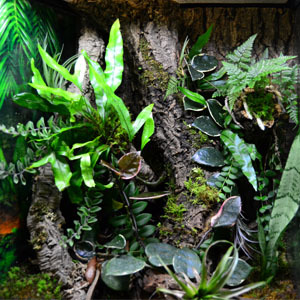 These offer totally natural climbing spots for arboreal animals while add to the realistic aesthetic of a live vivarium enclosure. Epiphytic plants will readily grow & climb on these in humid/moist environments, and are an awesome choice for plants like Tillandsia, Moss Slurry, and many vining species. Jungle Vines are available in two lengths, depending on your specific enclosure's requirements. 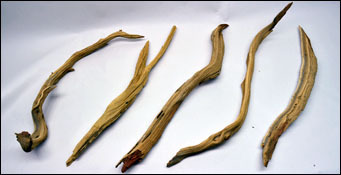 A single vine's diameter can range from around 3/4in to 1.25in across it's length (on average), and every piece is unique. Jungle Vine availability can be spotty due to import difficulties & delays, so pick some up while they are available! Limited quantities available. Please limit 5 per client. Please limit 5 (total) per client at these prices. These Ghostwood straights are a great lower-cost option for those looking for a simpler, straighter, and less "spread out" piece of Ghostwood. (Sometimes a super-branchy piece of wood just isn't the right fit!) We've used these to create the look of fallen branches, rigid vines, partially buried roots, and more. When creating custom backgrounds, these can be added as additional focal points around a larger hardscape, or even as a part of a centerpiece in small enclosures. Ghostwood gets darker when moist, as shown in this picture. Please note, although we refer to these as "straights" at NEHERP, they aren't completely straight, and have plenty of variation! 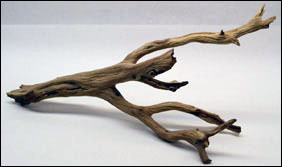 (They are fairly straight when compared to our best-selling Ghostwood branches) Please reference the photo above, as each piece can range a bit in overall shape & appearance. Limit 5qty per order at this price! 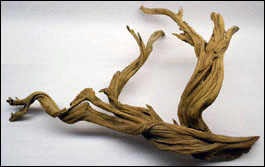 Ghostwood is considered one of the most sought after wood types in the vivarium building hobby, and a real favorite to everyone who works at NEHERP. An a fairly difficult type of wood to source, and we aim to keep an excellent selection in stock and ready to ship. This wood does great in all conditions; dry or wet! These particular dramatic branched pieces are hand-selected, & highly detailed. (Ask around - we ship the best looking Ghostwood in the hobby!) 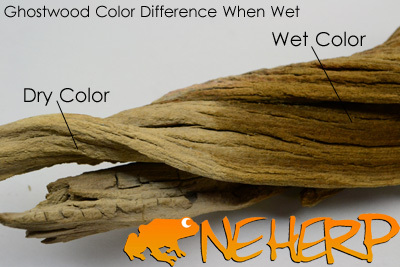 Ghostwood gets darker when moist, as shown in this picture, and becomes very dark brown once fully saturated. You won't be disappointed with the examples we pull for you! Grape Wood is a nice looking option for desert environments, but it's really not a good choice for any humid enclosures. (We explain this in detail in Vivarium Construction 101) In an effort to make more room for much higher quality Ghostwood & Cork decor, we've made the tough decision to drop Grapewood from our lineup. Everything Grape Wood can do, Ghostwood can do better. 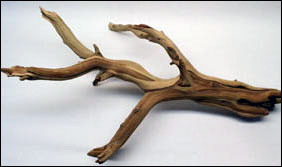 Malaysian driftwood sinks in water, and resists breaking down even in humid/wet conditions just like Mopani, but the texture & color of this wood is very unique. Raw, light, extremely intricate Manzanita wood. 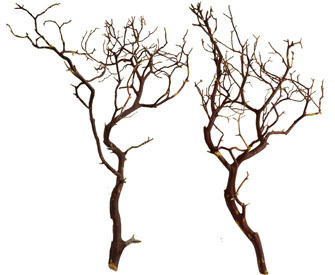 We don't sell the "solid line/log" Manzanita, only the very detailed "branchy" type (shown above) that looks great in a wide variety of conditions. Manzanita is suitable for both dry & humid habitats. Mounting these pointing downward in a custom background yields an amazing "root system" look. We guarantee you'll love the selection! A beautiful two color African hardwood. Mopani is one of the hardest and most dense wood types available, and is suitable in just about any type of environment. A common choice for aquarium enthusiasts for the wood's ability to sink in water, and hold up indefinitely. Suitable for enclosures ranging from aquatic to desert.